When I was about seven my family lived a couple of blocks away from a woman named "Mrs. Ward." Her backyard much larger than ours and she was willing to let us put a garden there. One of my chores back then was to go over to Mrs. Ward's and take care of the beans; you know - pulling weeds, watering the little plants and eventually - picking the beans themselves. I'm pretty sure that as often as not - I pulled up the beans, picked the weeds' flowers, and gibber jabbered at Mrs. Ward forgetting about the watering altogether. I don't remember Mrs. Ward ever being impatient with me though. In fact - mostly we talked about Bible verses we liked. It was while hanging out with her in the garden that I asked her about a Psalm I'd read on my own. In fact - I liked that particular Psalm so much - I'd memorized part of it even - the very first verses I'd memorized on my own ... not to get some forgettable prize from Sunday school - but because I got the words and liked them. Mrs. Ward said, "Yes. That's a good one." And of course - that Psalm was Psalm 116. 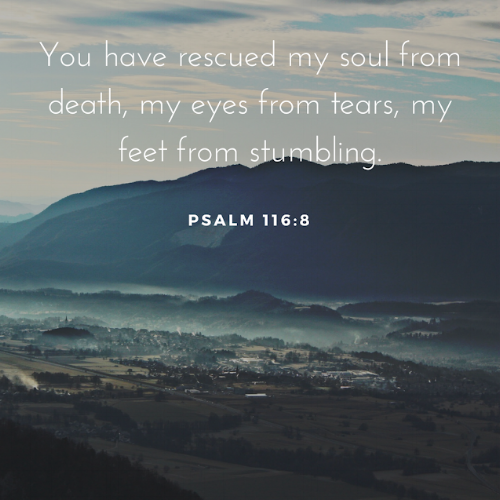 The Psalm spoke to me because it made God sound like He cared - about me. It just dumbfounded me that God would care at all about my little life of bicycles, friends, bullies, and perpetual absent-mindedness. I can't fathom why these verses sparked these thoughts and I don't propose that they should have the same effect on anyone else - but I do believe that somewhere between the first and the last verses of the Bible there's at least one passage that rings the bell for you too. Maybe you already know exactly what it is. Maybe you have a whole list of them written in your Bible's cover. I wish you could sit with Mrs. Ward in her garden on a sunny summer afternoon too. Maybe she had some gift for helping people find "their verses". But - as fondly as I remember Mrs. Ward - I'm confident God hasn't left the world bereft of wonderful people who can - one way or the other - spark your imagination regarding our God who not only could but would be interested in your life - all the big and small bits of it. February 26, 2018 /JC's Village C.C.M.